We picked this quote of Mark Twain’s for my dad’s eulogy. My sister suggested it and, instantly, we said yes! We all thought it so fitting. You may have come across this quote before. It’s a brilliant quote and a proper outlook on life, so I put this together. Of course, now it holds special meaning for me. For someone who thought life was short, he certainly had a lot to say about it. Mark Twain was one of my dad’s favorite authors. He had many of his books, including the Autobiography of Mark Twain, Volume 1. Take a look. A lover of life. The font is quite small, too! Volume 1 is 712 pages, not including the index. The existence of a Volume 1 suggests that there is a Volume 2. And there is, as well as a Volume 3. The third volume is scheduled to be released in the fall of 2015. The Mark Twain Project compiled the books, but the words are from Mark Twain. It’s quite a scholarly achievement. Whatever you’re dong, I hope you’re enjoying your weekend and your life! Next My Blog is Three Years Old! He also said (in the dedication from Following The Equator) “Be good, and you will be lonesome). Great great author and character. That sounds like something he would say, Guap. He has a lot of great quotes, doesn’t he? Thanks! Words I live by, Amy! And yes, that is quite the hefty tome! Thanks, Dale. So true, right? I wonder if my dad read it. It’s pretty daunting! It’s definitely for the true Mark Twain scholar. That really is one of the best quotes ever isn’t it – all the rules you ever need for life right there! I don’t think I’ve ever read any Mark Twain though (apart from his quotes that pop up here and there!). It truly does sum it all up quite nicely. It is one of my all time favorites! Mark Twain has so many good ones. I keep thinking I have read him somewhere along the way, but I don’t think I have. Oh, dear. I’m going to have fix that! Loved Mark Twain since I read Tom Sawyer and of course Huckleberry Finn. That is a brilliant quote for the passing of your dad. 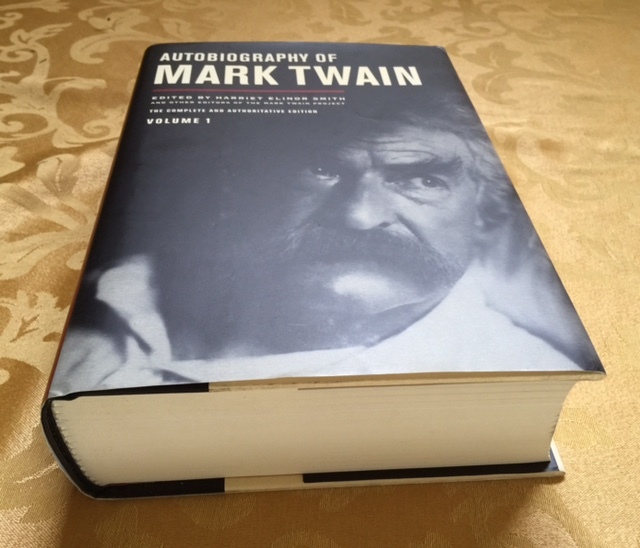 I doubt I will get around to reading Twain’s autobiography any time soon given the size of it and the amount of books I have yet to read, bet it is a fascinating read though. As soon as she read this quote, we said, of course, that’s it! It was the first one she read, too. It’s nice when things happen like that. My dad would have approved. I wonder if he read Twain’s autobiography, don’t know. To think there are more volumes! I read some reviews that said it was amazing. It’s quite an achievement. I can’t imagine a biography of my life spanning three large books. Oh my, guess I must get busy. I know, that in and of itself is simply mind boggling. At the rate I’m going, I just want to write at least one book, Carrie! My boss bought Volume I as a holiday gift for me a few years ago. I tried to read it. I really tried but I just couldn’t get into it. 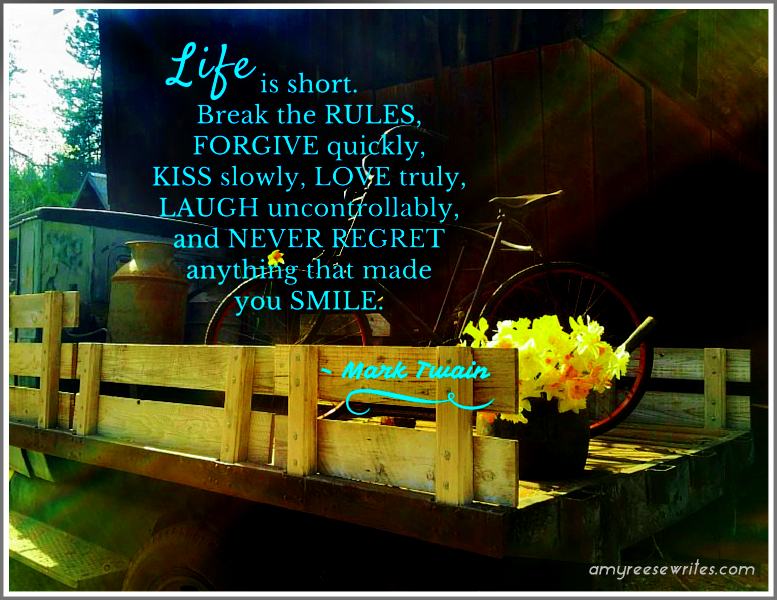 But I love the quote, particularly the very last part … never regret anything that made you smile. Most definitely. That’s a nice gift from your boss. Are you a Mark Twain fan? I honestly don’t think I could read it. I would probably be too anxious thinking about all the many books I want to read! I’ll try to read a few sections and see how it goes. I like that part about the never regretting, too! Thanks. Hi there, Audra!! How are you? Nice to see you here. Thanks for stopping by. This is a good one, huh? That’s a great quote, Amy. Good words to live by. Mark Twain was quite the guy. Thanks, David. I think if you can live this way, you’re a pretty happy person. Considering Twain’s satirical side, I’m confident the pondering leads one far away from the surface – much like life does. He was our Charles Dickens. One of the best. I didn’t understand how good and how important Huck Finn was until I became an adult. Time for a reread, methinks. Thanks, Mark. I’m so embarrassed to say I’ve never read it. I should excuse myself right now and read it immediately! In my quest to read to everything, this is now my next book. It’s really good and worth your time. Saying Huckleberry Finn is really good is like accusing water of being wet. Even though I haven’t read it, I’m really good at Huck Finning! So says my husband. 🙂 I will read it. In fact, I’ll read my dad’s copy. He might have notes in it, even.